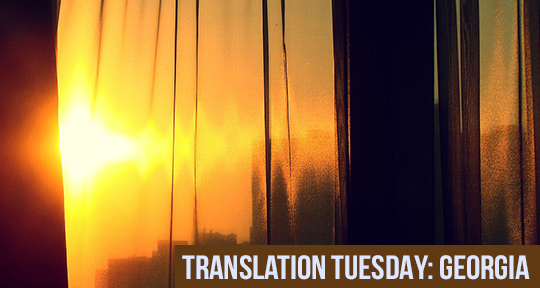 In this week’s Translation Tuesday, Guram Rcheulishvili tells the story of Vaja Jandieri, alone, in an unfamiliar environment, as he attempts to ski in Bakuriani, Georgia. Excitement and then ennui set in amongst the snowy slopes where the people speak Ossetian, and are from another world unlike Vaja’s . . .
Vaja Jandieri was now sitting in a small, warm room. He could hardly ever find such a room. This year, Bakuriani was extremely cold. Thin walls were unable to stop these freezing chills. Vaja was sitting, pleased that he had found such a warm room. The housekeeper set the tea to boil as a small boy memorized his algebra formulas. The door suddenly flew open, as a woman, his Ossetian neighbor, burst in. “This year is so cold,” she said. “Yes, woman, the walls aren’t able to stop it,” said the housekeeper. “At least here, it’s warm,” said Vaja.